Roughly one year ago I read and reviewed Rebecca Makkai’s second novel The Hundred-Year House. Looking back to those recorded thoughts compared to my memory I realize that a large part of my response to her novel stemmed from the power and promise of Makkai’s writing overcoming some flaws in the construction of a full novel. As impressive as the novel was, it really does resembles a collection of shorter stories interwoven around the history of a family and home. I wasn’t looking forward to another novel by Makkai (and I still haven’t read her first), but was rather really itching to see what she could do with short fiction. As in The Hundred-Year House, there are not necessarily actual ghosts here, and the rest is metaphor. But these opening lines to “The Worst You Ever Feel”, the first major story of the collection, set the atmosphere for Makkai’s collection. The opening very short tale, “The Singing Women”, also serves as a sort of introduction, serving as a modern fairy tale, an anecdote that establishes repeating, unifying elements of Music for Wartime. Many of the stories, with their hint of oddity, will appear like fairy tales. Interspersed with the main longer stories are shorter flash-type stories. Of these, three are marked as “Legends” in their titles, and they carry a semi-biographical relation to the Makkai family history. These three short ‘legends’ recall elements of “The Singing Women” where the relation between the number three and fairy tales – their emotion and power – is brought up. These shorter stories in the collection, particularly the three anecdotal ‘legends’ taken with “The Singing Women” will likely be the one aspect to Music for Wartime that divides reader reactions. Some may find them too short, and unnecessary. I however found their interludes to be among the most engaging, and they do help form the only structural coherence to the collection. 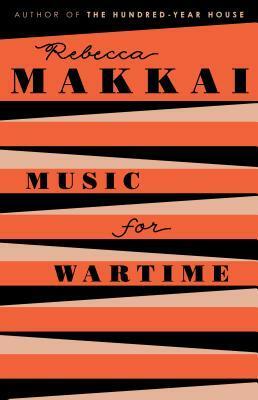 For the stories of Music for Wartime are very distinct from one another. They range in emotion and humor, plots, and protagonists. Stories feature different ages, genders, and relationships. Though some aspect related to ‘music’ crops up in most (indeed all the stories I ended up mentioning in this review), there is no overarching theme to the collection. Similarly, the plots of any single story are somewhat difficult to summarize quickly. Each of the major stories has a healthy dose of complexity and can go in unexpected directions from the setup. Yet Makkai manages to keep firm hold of the reader without dropping any of the balls she has in the air. Each of the main stories are great, but I do have some favorites. “The November Story” is about a woman involved in producing a reality show, who is tasked with manipulating contestants to form a relationship together, all while she struggles in managing her own real-life relationship with her girlfriend. “The Miracle Years of Little Fork” reminds me of the TV show Carnivale, with a blend of historical and hints of magic as a circus comes to a small town. “Couple of Lovers on a Red Background” may be the most surreal and memorable story in the collection. In this one a woman finds J.S. Bach living in her piano. She starts introducing him to the modern world, and soon enters into a sexual relationship with the goal of creating a child with an artistic genius. There is no explanation to this odd situation, it just is. And Makkai does exceptional things with it, digging into her protagonist’s psychology and themes of basic human drives. In “Cross” a cellist discovers near her driveway one of those memorial markers, placed after the death of a teenager in a car accident. Her annoyance with its presence contrasted with grief over a tragedy leads to a sort of crossroads in her own life: rediscovered friends and new opportunities. I’ve noticed several other readers remark that they thoroughly enjoyed Music for Wartime despite not normally being fans of short fiction. Like those that would make a blanket statement of ‘I don’t like vegetables’, until they happen to taste vegetables cooked properly and deliciously, Makkai’s collection is likely to have a similar effect. The stories are well-written, engaging, and varied. They are literary, but approachable and have just enough of a twist of weirdness to be intriguing but not off-putting to a broad audience. I’ll join others in highly recommending this.